Report by Werner who led the ride: Dark clouds hanging over Canada Water when I got there. Fortunately the clouds lightened up and with 3 other riders headed off on the by now almost traditional post-santaic ride. Looking at the car-park, Surrey Quays must have been full of happy shoppers but roads were extremely quiet and we set off through Southwark Park and Druid Street to cross an almost traffic-free Tower Bridge. Hardly anybody in the City so we could tunnel under Fenchurch Street station (honest, it's not a dungeon and there's a way out at the other end) and ride along some small roads for a return visit to Ai Wei Wei's “Forever” outside the Gherkin. "Ghost": http://hyperallergic.com/240353/bells-bicycles-and-other-monumental-sculptures-land-in-londons-financial-district/ . Then through a maze of twisty, little passages past Jamaica Winehouse and around St Michael's Cornhill back to some wider but still deserted streets for maybe the narrowest bit of one of England's oldest roads, Watling Street, https://h2g2.com/edited_entry/A24369951, to reach St Paul's. Around it and back into a mediaeval maze of lanes. Queen Victoria Street was utterly free of cars when we crossed it, we then fought our way up Southwark Bridge into a strong wind to return to Southwark and follow the canonical route along the river to Canada Water. Lovely day (14 degrees, occasional sunshine) for our final scheduled Heathy Ride for 2015. What a great early winter we are having, weatherwise. Perfect for our last scheduled ride following a great route devised by ride leader Werner Wiethege. 8 riders headed off from Burgess Park on a "+" ride towards Vauxhall where we rode the new segregated cycle lanes on Cycle Superhighway 5 from the Oval to Pimlico. Two-way track changes sides just before the rail bridge with a signalised crossing phase. This worked, but could do with an extra repeater signal on the north side. Turning right from Vauxhall Bridge on to Millbank was not very intuitive. Overall, new tracks judged a big improvement. 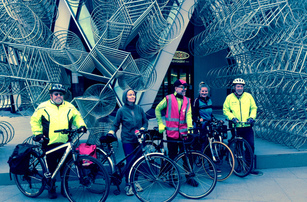 Seven riders at Canada Water on a gray December morning. Not too cold, but rain forecast (that never materialised as more than very light and patchy). Set off for Blackheath on an inland route. Deviated slightly from the planned route by continuing up the railway path to Surrey Canal Rd rather than crossing on the footbridge to Trundleys Rd. Still no sign of the new path from South Bermondsey that forms a key link on Quietway 1, but large hoardings block the view. Hope Sustrans are working away in there. Paths down Surrey Canal Rd have been partly resurfaced and the paths in Folkstone Gardens have been widened and resurfaced. But still no improvement in the dangerous crossing of Trundleys Rd. Without a decent crossing the work on improving paths will be wasted as few cyclists will use Q1. Idea was to take advantage of the Lord Mayor's Show to find some traffic free streets in the City. Here are some notes from ride leader Werner, who attempted this with just 2 regular riders (was raining with a terrible forecast). decided against Blackfriars Bridge, turned round and rode it up again. said hello when the riders came out. Water at an embarrassingly late 12:01. 10 o’clock at Canada water on a bright Autumn morning. 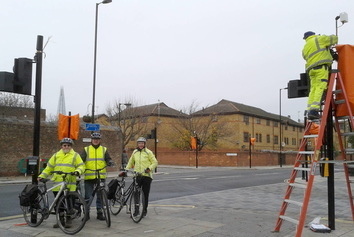 15 riders assembled for a gentle meander around the Rotherhithe area, with just a small incursion into Deptford. Started round Greenland and South Docks to the Deptford riverside. Then back to Greenland Passage where we stopped to wave to the passing Waverley. The restored Clyde steamer was a fine sight, jam-packed with passengers waving back from every available deck. Continued along the river westward to Durand’s Wharf. Stopped and discussed how fine things would be when the projected Brunel Bridge provided cycle and pedestrian access to Canary Wharf. From here a short excursion towards Russia Woodland via the Holyoake path and the bridge over Salter Rd. Unfortunately the new building at Blondin Way has closed the path for now, so we diverted via Downtown Road. Russia Woodland looked its autumnal best. After a short circuit we looped back to the river at Pageant Crescent and continued to Surrey Water. Here we made a second foray into the hinterland, arriving eventually at Stave Hill which some of us ascended (see picture). From Stave Hill back to the river via Dock Hill Avenue. There we observed in wonderment the fine fountain – all restored and making a fine sight. In 20 years had never seen this fountain fountaining. Apparently it began working again about a month ago. Next headed round by the Thames Path to King Stairs Garden and across to Southwark Park. We noted some significant improvements being made in sports facilities. Two new tennis courts, plus the original 2 resurfaced (not reopened yet) and the work on restoring the athletics track in busy progress even on a Saturday morning. Again, in 20 years, have never seen this track in use. Will be a while before that work is finished, but will be excellent when that is the case.